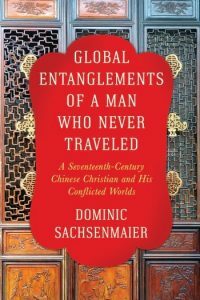 Dominic Sachsenmaier, Chair Professor of Modern China with an Emphasis on Global Historical Perspectives at the Department of East Asian Studies and History at the University of Göttingen, visits the Institute for Advanced Jesuit Studies to speak about his latest publication. The discussion takes place on October 5 at the Institute’s Library at Boston College. More information about Sachsenmaier’s book is available at Columbia University Press.